Can’t wait to see the film! I run VinylVenue an online record shop. I’d love it to be a physical shop where people could pop in an browse and chat, but running a shop just isn’t viable these days, unless you are very lucky with location. It’s a massive shame. 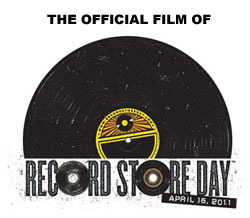 I applaud what record store day is about… but why exclude anyone with an online presence that brings in the majority of there income? I don’t get it! Times have change, whether we like it or not. Surely the idea is to promote companies with a genuine interest in the music over the giants like Tesco. I’d like our record shop to be a community, just like the real thing…. Any thoughts on this are welcome.